They can be red, green, orange or almost the brown colour of chocolate. They can be pointy, round, small, club-like, long, thin, globular or tapered. Their skins may be shiny, smooth or wrinkled and their walls may be thick or thin. You guessed it - chillies! This month's event @Kitchen Chronicles is the famous "Think Spice" event which was started by Sunita Bhuyan of Sunita's World. She does not need any introduction at all. Her blog is always a breathtaking blog with all those beautiful clicks. 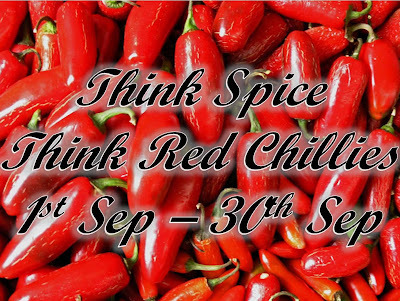 So it is "Think Spice - Think Red Chillies" for September. To the chilli connoisseur, each type has its own distinctive flavour, and a particular variety of chilli may be used to lend a specific dish its unique taste. There are more than 400 different varieties of chillies found all over the world. The world’s hottest chilli “Naga Jolokia” is cultivated in hilly terrain of Assam in a small town Tezpur, India. Chilli became extremely popular in India after it was first brought to India by Vasco-da-Gama. Chilli found its way in ayurveda, the traditional Indian medical system. According to ayurveda, chilli has many medicinal properties such as stimulating good digestion and endorphins, a natural pain killer to relieve pains. Chilli is an indispensable spice used as basic ingredient in everyday cuisine all over the world. The chilli powder is made by crushing the dried chilli having chilli flakes and chilli pods. 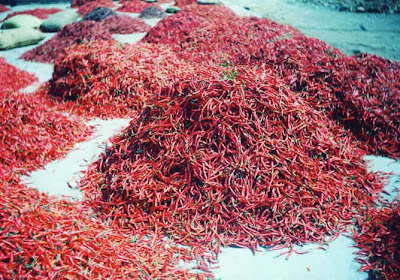 The chilli powder began to be used to different countries. 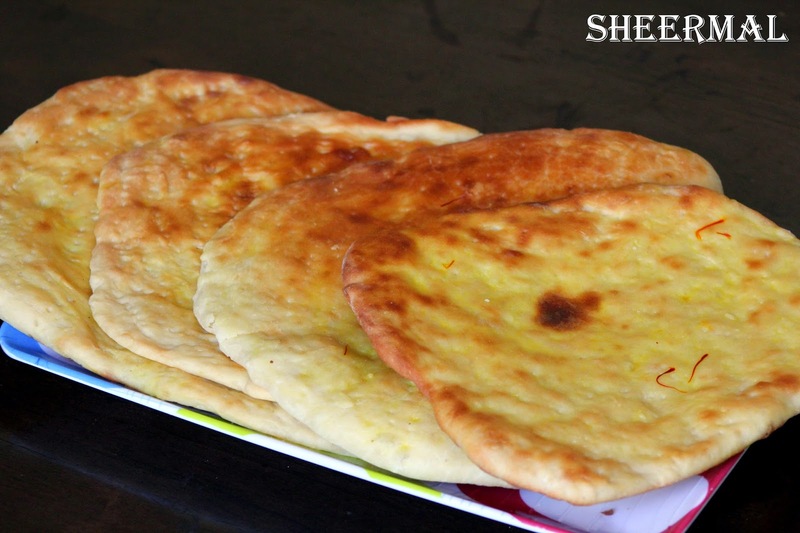 Today, it is unimaginable to think of India cuisine without the hot spice, chilli. Generally, the smaller chillies are the most pungent. Because some chilli peppers are hotter than others, it pays to know your habaneros from your poblanos and your guajillos from your jalapenos. The heat rating of chilli peppers is related to its Scoville number. The higher the number of Scoville Heat Units (SHU's) assigned to a chilli pepper, the greater will be its burn. If you have braved the effects of eating fresh chillies and your mouth is burning, don't be tempted to drink water, as this can intensify the effect in the short term. Instead, have either yoghurt, sour cream, cheese, milk, cucumber or chopped mint. • It has been proposed that the eating of chillies results in the production of endorphins by the body. These are the feel-good chemicals that create a temporary feeling of euphoria. • Chillies are reputed to aid digestion. • The hot stimulating properties of chilli make it useful in clearing sinus passages, and it has been found to reduce mucous production in certain instances. • Chillies appear to have some type of anti-inflammatory property. This is thought to be linked to their ability to cut recovery time of colds and flu, when taken liberally in the early stages of these ailments. • Research originating in Thailand has found that people who eat a diet high in red peppers experience a much lower incidence of blood clotting. • Scientists have now concluded that chilli does indeed possess fibrinolytic activity, meaning that it is able to break down blood clots. • Chillies are also thought to help buffer pain from ailments such as arthritis, headaches and menstrual cramps. • It has been postulated that a high daily intake of chillies may improve circulation to the hands and feet, in those suffering from poor circulation. • Other responses of the body to eating chilli include increasing salivation in order to try and refresh the mouth, and an increased rate of sweating. (a) Post any dish featuring Red Chilli as the main spice. Red Chilli can be used in any form (finely powdered, freshly ground or whole) and any variety of Red Chilli can be used. Both vegetarian and non-vegetarian posts are welcome. 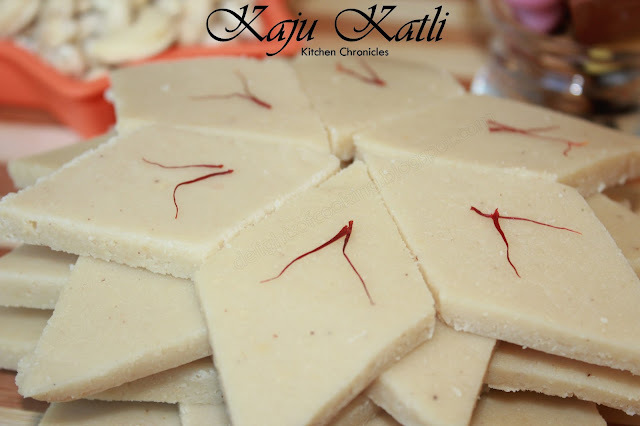 (b) Post as many Recipes of Red Chillies as you like on your blog this September 2009. The more the better. (c) Linking back to this "Think Spice - Think Red Chillies" Announcement - and to Sunita's blog - http://sunitabhuyan.com/?page_id=341 is a must. (d) It would also be very much appreciated if you can also include any information about Red Chillies. (g) Old post’s are also accepted only if it is re-published and linked back to this announcement post and to Sunita's blog - http://sunitabhuyan.com/?page_id=341. (h) E-mail me to kitchenchronicles1(AT)gmail(dot)com with SUBJECT as Think Spice - Think Red Chillies" along with the following details..
(i) Deadline for all the entries will be the 1st October-2009. (j) You don't have a blog but want to take part in this event, it’s not at all a problem. You can send me your Recipe along with the picture of the dish to kitchenchronicles1(AT)gmail(dot)com with SUBJECT as "Think Spice - Think Red Chillies". Don’t forget to mention your name and your location. And also please remember to rush in your entries for A.W.E.D German going on here. 3 more days left. Ayurveda prescribes diet as per the body types. wow.. nice event... great informations. Nice event!Red Chillies will be quite a challenge for me to make as I dont use it as much.Will try though:)BTW will send you my entry for AWED German in the next day or two! Red chilli event...Sounds intersting...am also looking forward to the round up already!!! I`ll see if I can send some thing..
Nice event... wonderful info.. All the best!! Will be glad to send some in. As for the use of bindis in thayir pachchidi,It is quite nice. I toss them longer in the kadai/non-stick pan until browned,sprinkle youghurt(buttermilk) of and on until it cooks, cool and add to yoghurt. Or try microwave the bindi, that's really good too. Please pick your award from my blog! This is such an apt event. Have a great time hosting. Will try to send in somethings. SO much useful info on chilies,Lakshmi! Happy hosting! Just wanted to let you know that I sent across my entry for this event. Hello Lakshmi ~ I am a chilli novice, not knowing one from the other much. Are "red chillis" a specific Indian-type hot chilli or can ANY red-color chilli qualify for this event? For instance...Chipotle which is one of my favorites currently. Only a week left and would like to try my hand at it. Please let me know. Lakshmi ~ My entry is COMING on the last day (today - OCT 1st)...once it's daylight here again and I can take my final photo. The post is done with links to your site and this event, but not up on FigsWithBri.com yet. Still need the feature picture, which I'll take in the morning. Sorry for the last minute entry. Maple furniture can also be stained so as to look very similar to cherry in appearance. Red maple cabinets are another good choice to bring warmth and glow to your kitchen without the higher cost of a cherry kitchen. Hi there! Your post rocks also as getting a respectable amazing recognize! My partner and I stumbled over right here diverse internet site and believed I need to examine items out. Appear ahead to exploring your web page but again.